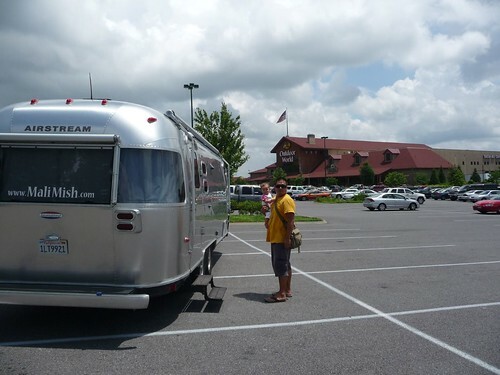 Mali Mish – Day 93: Kitschy America – Pigeon Forge, Tennessee. 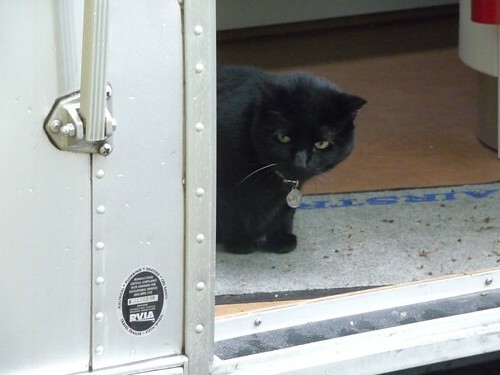 Yoda will surely miss seeing all of the wildlife that she got to spy on through the wrap around windows as well as the hail storm that scared her half to death. 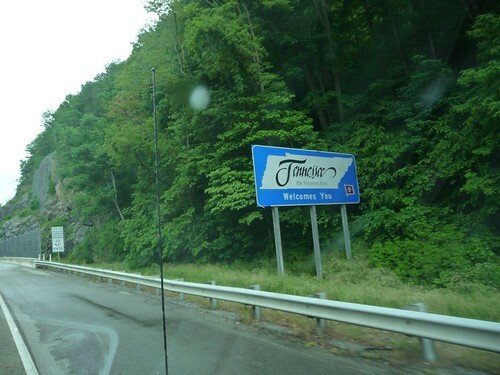 We left North Carolina and headed west towards Tennessee through the I-40 towards Knoxville, TN. It takes us through much of the Great Smoky Mountains and has proven itself to be one of the most beautiful drives on this trip so far. This time of year, the forest is dense and and the sky is scattered with beautiful puffs of cumulus cloud formations that gives the national park its name. As we got near Knoxville, we took a little detour at a small town of Sevierville, TN for a much needed break and also to do some window shopping at the Bass Pro Shop that just happens to be at the exit. I know, Marlene thought it was a coincidence too! 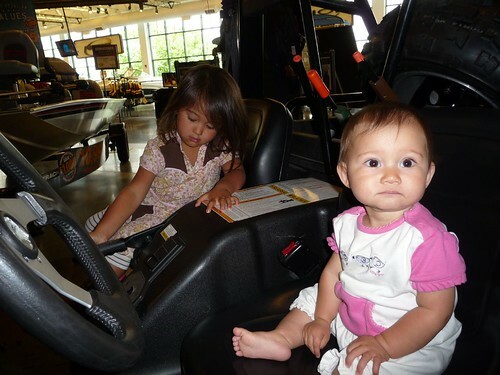 Much to Marlene’s chagrin, Ava is a big fan of Bass Pro Shop. 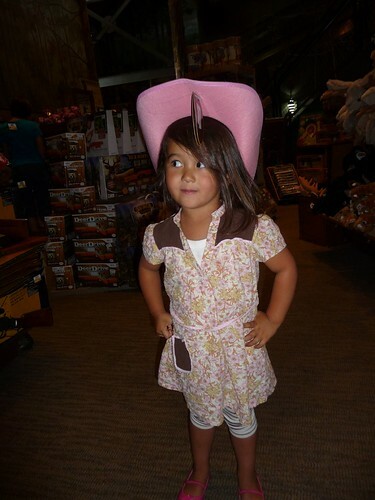 She likes it not because of the pink cowgirl hats or the endless camping gear, she likes it because there are animals there. Taxidermy animals. She doesn’t quite get the concept that these animals were shot in the wild and brought here to be put on display for other hunters to admire. 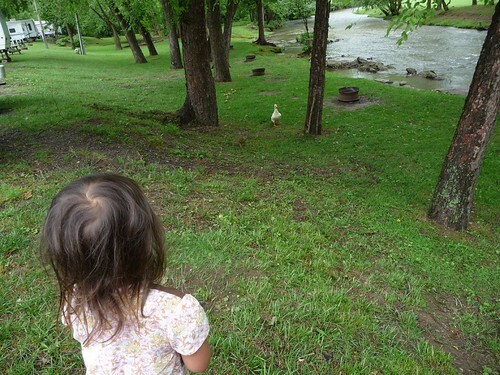 She just knows that these kinds of animals are great because they don’t bite. Our last visit to a store like this was just outside of San Antonio, Texas at a Cabela’s. That one was enormous and somehow had on display even a stuffed polar bear. Not being hunters ourselves, we don’t quite grasp the desire of going and shooting down a polar bear so it can be stuffed and displayed but it does give us an opportunity to admire how great and beautiful the animal once was up close. This store was much more tame in the display of taxidermy animals so Ava diverted her attention to other items on display. Like this side-by-side off roader. 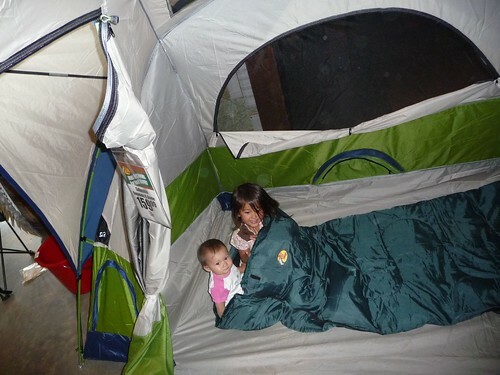 And this tent with sleeping bags already inside for the girls to take a mid day nap. 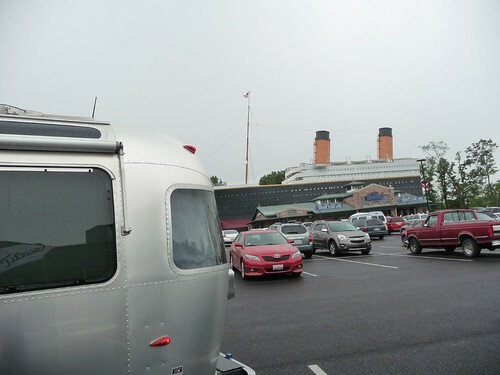 She liked playing in this tent so much it made me wonder for a second if the Airstream was maybe an overkill. 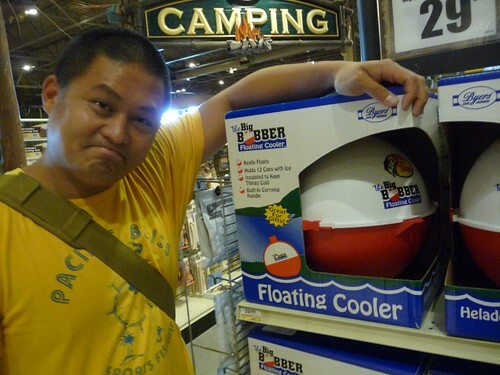 I too found something I think I might enjoy like this floating cooler called ‘The Bobber’. 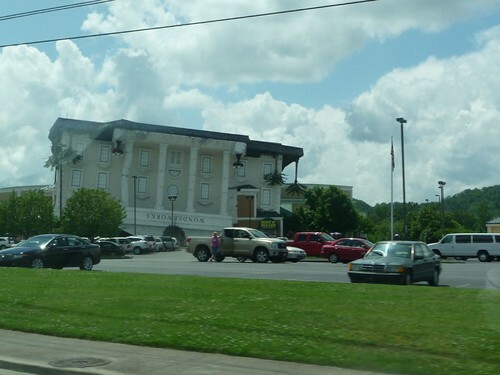 After our stop in Sevierville, we extended our detour to a little town in western Tennessee called Pigeon Forge. Also know as the home of Dolly Parton. Pigeon Forge is a small town that probably had not much going on back in the days when Dolly was a child. 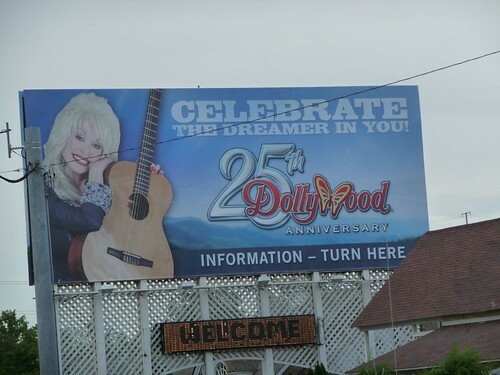 Since her rise to fame and subsequent ownership in the Dollywood amusement park, it has since become one of the most concentrated tourist traps in the country. In a stretch of about a couple of miles, you can visit an upside down mansion, a dozen miniature golf courses and more go-cart tracks then I had fingers to count. Being the… ahem… ‘seasoned’ travelers that we are. 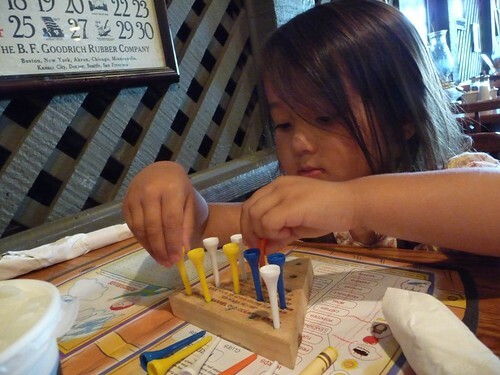 We resisted many of the attractions and decided to get lunch at a traveler’s staple of a restaurant – Cracker Barrel. Believe it or not, just like our Waffle House visit in Charleston, SC, we have never been to a Cracker Barrel until now. Ava quite enjoy the golf tee Chinese checkers game even though she has no idea how to play it. I must say that the food was pretty good but the service? The service was over the top today. I think our waitress checked on us after each bite we took. And refilled our drinks after each sip. We felt like we were on a hidden camera show or something. Wonder if all Cracker Barrel’s are like this? 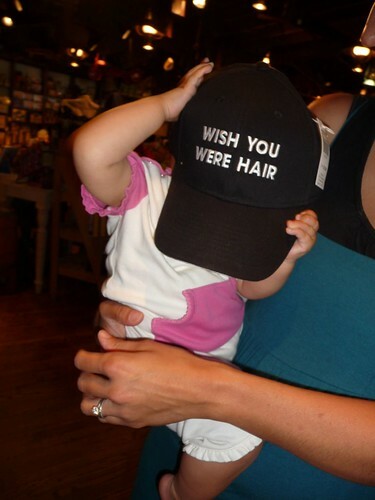 Mila was not quite as pleased when Marlene tried to buy her this hat. “I am still just a baby! Mom!” she said. It turns out, the force is not quite as strong with us as we thought. 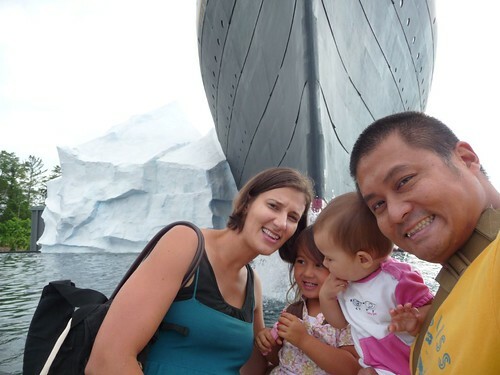 After seeing one over-sized road side attraction after another, we succumbed to the giant Titanic replica and decided to pay a little visit. This is apparently the world’s largest replica of the ill-fated ship and is filled with memorabilia from collectors around the country. Although the displays were interesting and well designed, it was a little pricey at $20 a person that last barely over an hour. They did not allow any photography inside and strongly suggested that since the exhibitions are all ‘copyrighted’, it was some how illegal for us to do so. I guess they have never heard of ‘fair use‘. Also rather than putting your cell phone on mute, they also asked everyone to completely turn off their phones because apparently their alarm systems used to protect some of the artifacts is prone to false tripping by the wireless frequencies. Surely they are telling the truth and not actually worried about someone taking camera phone pictures of their ‘copyrighted’ exhibits in the attraction. 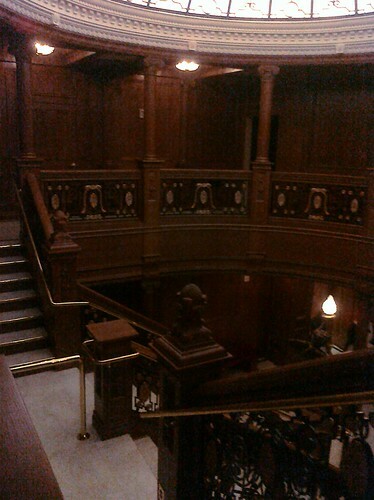 Well, for the purpose of exercising my fair use rights, I took a little picture of their full scale replica of the Titanic’s grand staircase. I am no expert to the Titanic but it pretty much looked just like everyone in the world has probably seen it in the James Cameron movie. Many of the displays in the exhibit showed authentic objects that once was on the ocean liner. 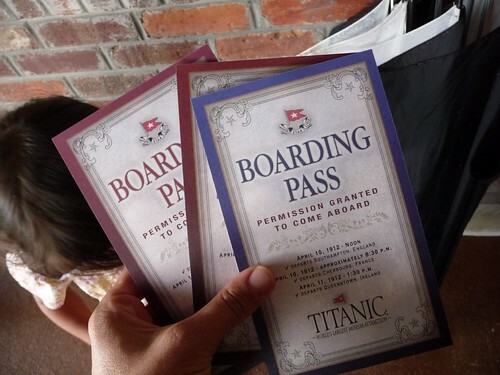 What many people don’t know about Titanic is that it did not make the trip non-stop from Southhampton England to New York but rather it stopped briefly in Ireland. Many letters were sent during that stop of the trip that were written on the rare letterhead as well as photos and objects taken from the boat when some of the passengers got off at the stop. One of the most valuable items here is one of the life jackets that was tracked back to the person who wore it that fateful day. Apparently no others exist today can make that claim making their life jacket a one-of-a-kind that is claimed to be worth its 7 digit price tag. 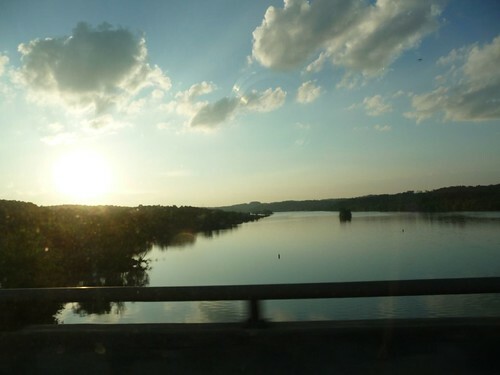 Tonight, we will make our way to Chattanooga, Tennessee while the sun sets over the mountains behind the Tennessee river. Day 92: Tupelo Honey Cafe in Asheville, NC. 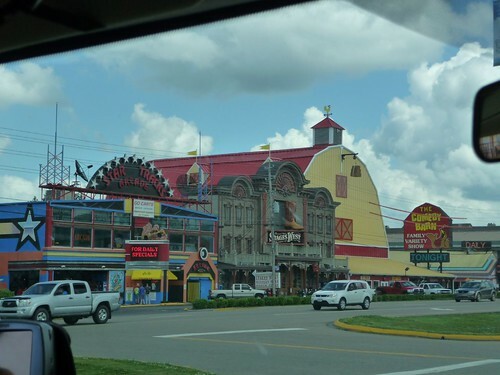 3 Responses to Day 93: Kitschy America – Pigeon Forge, Tennessee. A close miss! I’ve been vacationing in Pigeon Forge for a few days now! I’m surprised one town can support so many go kart tracks, zip lines, and helicopter tours. Hi! I took up to following your blog before my road trip in Florida, and I’ve followed your adventures since. I’m beginning to worry a little at your silence these last few days… I hope you’re all doing fine! I hope to read you soon!